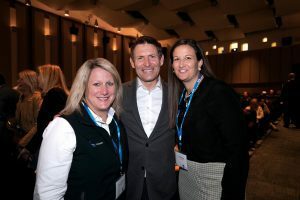 Steve Young (BA ’84, JD ’94), on hand at the Common Ground IV event held at BYU, poses with the annual NCAA event’s leader, Amy Wilson (left), and BYU’s Liz Darger (right), a member of the Common Ground leadership team. Photo by Jaren Wilkey/BYU. Last fall BYU hosted an NCAA forum to explore how LGBTQ and faith-based communities can work more cohesively in college sports and higher education. BYU is the first NCAA Division I institution to host the annual event, called Common Ground. BYU first joined Common Ground in 2016, sending Elizabeth J. Darger (BS ’00, MS ’04), senior associate athletic director and senior woman administrator for BYU athletics. Darger now plays an active role on the Common Ground leadership team. In his welcome address to Common Ground participants, BYU president Kevin J Worthen (BA ’79, JD ’82) explained that, as a university sponsored by The Church of Jesus Christ of Latter-day Saints, BYU upholds the belief that all human beings are created in the image of God and each person has a divine nature and destiny. NCAA vice president of inclusion and human resources Katrice Albert joined President Worthen in opening the forum. Along with the formal meetings, the Common Ground leadership team met with BYU student-athletes and coaches to discuss some of the challenges faced when talking about religion, sexual identity, and other parts of identity. Coaches discussed ways to create a safe environment for athletes. In addition, in an event open to campus the night before the formal meetings, Common Ground leadership team members shared their own stories and how they came to join the Common Ground discussion. Muslims and Latter-day Saints at BYU discover familiar faith and common ground. Finding common ground is better when you're surrounded by some of the greatest peaks in the world.